Stems decumbent to erect, usually forming leafy clumps, 3-10 dm, herbaceous or suffrutescent basally, usually glandular-viscid, more densely so distally. Leaves spreading or ascending; petiole 0.1-2.2(-5) cm; blade broadly deltate or ovate, 2-5(-8) × 1.7-7(-12) cm, fleshy to slightly succulent, base rounded to cordate, apex acute (rounded), glabrate to glandular-villous. Inflorescences usually thyrselike, often narrow; involucres 7-16 mm, lobes narrowly lance-oblong, base 30-50% of height. Flowers 1 per involucre; perianth usually white (pale pink), 1.3-1.8 cm. Fruits dull reddish brown to almost black, rarely with 10 inconspicuous, paler lines, sometimes with several very shallow grooves, broadly ovoid, 4-6 mm, surfaces smooth or very slightly rugose. Flowering spring, occasionally other seasons. Sands and rocks on slopes, cliffs, and canyon sides in open arid and semiarid areas; 0-400(-900) m; Ariz., Calif.; Mexico (Baja California, Baja California Sur). 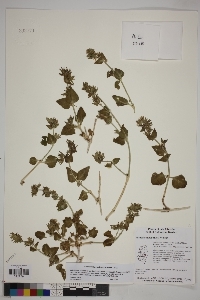 Duration: Perennial Nativity: Native Lifeform: Subshrub General: Herbaceous perennials, to 1 m tall, stems decumbent or trailing to erect, usually forming leafy clumps, repeatedly branching in forks, herbage herbaceous or suffrutescent basally, usually glandular-viscid, (sticky), becoming more densely so distally. Leaves: Opposite, broadly deltate or ovate, 2-8 cm long and to 12 cm wide, fleshy to slightly succulent, bases rounded to cordate, tips acute to rounded, surfaces glabrate to glandular-villous, leaves spreading or ascending, borne on petioles to 5 cm long. Flowers: Flowers white to pale pink, of funnel-shaped perianths 13-18 mm long with 5 lobes and lightly hairy surfaces, involucres narrowly bell-shaped, 7-16 mm long with narrowly lance-oblong lobes and spreading glandular-hairy surfaces, stamens 3-5, exserted, stigmas spheric and exserted, flowers subtended by 5 leafy, narrowly lanceolate to deltate or ovate bracts 8-13 mm long, 1 per involucre, borne in narrow, thyrselike inflorescences. Fruits: Broadly ovoid anthocarps,4-6 mm long, dull reddish brown to almost black, rarely with 10 inconspicuous, paler lines, sometimes with several very shallow grooves, surfaces smooth or very slightly rugose. Seeds solitary. Ecology: Found in sandy and rocky soils on slopes, cliffs, canyon sides, in open arid and semiarid areas and desert scrub communities, from 0-3,000 ft (0-914 m); flowering March-May. Distribution: Arizona, California; Mexico. Notes: This 4 o'clock has distinct broadly ovate to deltate (triangular) leaves with conspicuous veination on the undersides, white or pink flowers in small clusters at branch tips or in leaf axils, and sticky, glandular pubescent herbage. An anthocarp is a fruit with the achene or utricle enclosed in the persistent, fleshy, leathery, or woody base of the calyx. This species is not treated in older versions of Kearney and Peebles. Ethnobotany: Specific uses for this species are unknown, but other species in the genus have uses; petals boiled and used as a light brown, yellow, red, or purple dye for wool. Synonyms: Hesperonia tenuiloba Editor: LCrumbacher2012 Etymology: Mirabilis is Latin for "miraculous or wonderful", and tenuiloba means with finely-divided or slender lobes.